We kiss through the mask now? Pretty awesome, right? Unfortunately, I don’t think you’ll understand or care much about what happens in the story if you’ve never read Fraction’s Hawkeye, but it’s still a pretty creative – and cute – book. Sci-(Non)Fi: The Future of Population Growth? This is a Guardian video of “statistics guru” Hans Rosling explaining the future of fossil fuel distribution and population growth. Listen closely as he glosses over a fact that doesn’t fit with his socialist political message. Old Hans mumbles through the fact that population growth will stop. (He also fails to address his observation that using more fossil fuels correlates with lower child mortality rates). The fact is, scientists have known for some time that world population will soon begin to decline. Birth rates in most developed countries have been on the decline for decades. Most scientists and statisticians studying population expect the world population to decline after it peaks at 10 billion. So who worries about fossil fuels? Keep using them, and your grandchildren are more likely to survive into adulthood. After the world population peaks, more Legos for them. I’m assuming you’ve already seen the movie if you’re reading this. So are they really spoilers if you know what happened? If you haven’t seen the movie, none of this will make sense. Skip to the last paragraph. I agree with whatever objections were in most negative or measured reviews (no character arc, no gore, no ending); however, I enjoyed the movie well enough. Sure, Brad Pitt’s character didn’t have an “arc,” but that’s only a recent requirement of our pulp heroes. Before Daniel Craig, James Bond was the same person at the end of a film that he was at the beginning. Did Adam West’s Batman ever grow or develop? If you think that World War Z should be exempt from such exemptions, I’d like to remind you that it’s a freakin’ zombie movie. Pitt’s character was more of the vehicle to take the view on the world tour of Zombie World. Some reviewer said that World War Z was more like a video game story where the characters move from location to location the way a BioWare game moves. And that works for this film. In a lot of ways, World War Z is pretending to be a hero-driven narrative, but it’s also trying (and probably failing) to capture some spirit of the source material. Having Brad Pitt move up through the different game levels is a possible to try this. I do agree that the ending was a big problem. One would’ve thought that the mechanics brought in to fix the thing (Drew Goddard and Damon Lindelof, both of whom you love from Lost) could’ve done a better job. 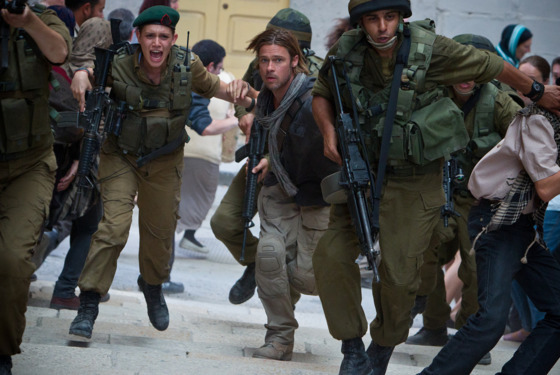 Instead of an ending with a bang, the film’s big moment is Brad Pitt walking down a hallway. It’s the equivalent of the original Star Wars film ending with the Millennium Falcon delivering Princess Leia to the Rebel Alliance and the destruction of the Death Star tacked-on as an epilogue. It would’ve been more fun if the getting the vaccination was tied to a big, emotional fight for Brad Pitt. Like, say, there was an outbreak on Nova Scotia where Pitt’s family was staying. Then, he’s got to swing in and rescue them while delivering the vaccine idea to the authorities. But I guess money was an issue, and they had this big, Russian fight scene to fit in. If you like epic video games, this is probably a movie you enjoyed. If you like zombie films, this probably wasn’t the movie for you. If you like Brad Pitt, you probably thought his hair was funny. (And if you’re a super nerd, you’d be wondering how the cute Israel chick found a baseball bat in Wales). Geez, I hadn’t thought about how long it would take to get to actually seeing the monster when I decided to post on MetaMorphosis once a week, but he’s finally here! Thanks to everyone who’s following this blog and my webcomic. If you haven’t been keeping up with MetaMorphosis, today’s a good day to see how the zombie brother’s doing! Jim Kwik wants you to be a superhero. I discovered this guy on the Singularity Hub. Kwik’s passion is learning how to learn and teaching other people how to do it, and the way he sees it, learning is the human being’s true superpower. Sounds corny? Well, he proves it. According to Kwik, there’s no such thing as a bad memory or a good memory; there’s a trained memory and an untrained memory. And the memory thing is just the beginning. What’s even better: he wants everyone to learn how to learn for free at Superhero You. If it can help you get smarter, why the heck not check it out? I’m ambivalent about this one. Some upperclass liberals have made a sci-fi movie about the class divide, which rich sci-fi writers have been doing since H.G. Wells. I’ve never understood how wealthy artists could espouse socialist views; no matter what qualifiers you put on it, socialism places the individual as secondary to the group. Art is, among other things, an expression of the individual. In some form or another, a socialist society will eventually limit or censor art. The USSR and its censorship of artists is the clearest example. Famously, Sergei Eisenstein, who was such a proponent of socialism, was censored because his art didn’t fit with official social realist doctrine. This isn’t even to get into the extreme cases of artists like poet Anna Akhmatova, whose son was imprisoned because of her opposing political views. Before you make excuses about how the USSR was “different” and give your knee-jerk reaction about how the rich should share their spoils, and how the 1% greedy bastards are out to destroy the world for their own personal gain, bear in mind that to be one of the top 1% of earners in the world, you only need to make about $47,500 a year. That’s most of the United States. You thought you were Matt Damon in this movie, but instead, you’re Jodie Foster. It looks like the new film will make up for the last one. The addition of Henry Sanada almost guarantees that The Wolverine will be better. You are currently viewing the archives for June, 2013 at Princess Revolver Media, LLC.